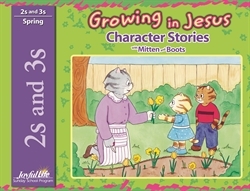 Two- and three-year-olds enjoy stories about animals, and they will quickly come to love Mitten and Boots. As they listen to the stories, they will learn important lessons about honesty, obedience, unselfishness, and loving God. The large, colorful illustrations will help the children feel as if they are a part of each setting. Ask the questions included at the end of each story to help the children develop good listening skills.